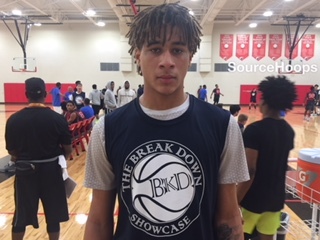 One of the most well organized events in a series of events that take place every fall, The Breakdown Showcase took place this past weekend in Tampa, Florida at the Carrollwood Day School. Reggie Burke and his Bay Area Hoops Staff have built this event from the ground up and from year to year it continues to grow with some of the best talent in the Tampa Bay area. 2020 6’1 PG Isaiah Josue (Mater Academy) – He possesses good size with good scoring ability. He also has a smooth mid-range pull-up game to generate most of his points. 2020 6’4 G Jadrian Tracy (Oldsmar Christian School) – He uses his strength and athleticism to attack the rim fearlessly. He’s also a very good rebounder on both ends of the floor and has the ability to start and finish the break. In the paint he can finish in a variety of ways. 2020 6’7 F Kobe Gibbs (Oldsmar Christian School) – He is long and athletic, with a tremendous upside. Although he can score around the basket, he possesses some perimeter skills such ball handling and a short jumper. He got the opportunity to also showcase his highlight reel talents with a few high-flying dunks. 2020 6’5 G Jacob Crews (Superior Collegiate Academy) – The University of North Florida pledge is a solid passer with extended range on his jump shot. He was able to knock down shots from deep behind the arc. He also displayed his leadership skills by being very vocal on the court. 2020 6’4 G Godwin Ilumoka (Superior Collegiate Academy) – He is a highly competitive athlete who always plays in attack mode. This weekend he used his ball handling to create opportunities for himself and others. 2019 5’10 PG Jalen Brown (Strawberry Crest HS)- He is a crafty, quick passer who can elusively get by defenders. He has expanded his game over the years to be able to knock down open shots. 2022 6’5 F Christopher “CJ” Hawkins (Berkeley Prep) – He is a tough inside player, who has good hands, solid footwork while his perimeter game continues to improve. Although a work in progress, he displayed a tremendous upside with nice size and body. 2022 6’3 Kaleb Walters (Miramar HS) – He has long arms, and crafty ball handling. He can also knock down shots off the catch and has creativity off the bounce to get by defenders. 2019 6’8 F Andrew Danson (Tampa Jesuit HS) – He has good size, and is a good athlete. He flourishes off being the receiver in pick and roll. With soft hands, and the ability to finish through contact, he also rebounds well on both ends of the floor. 2010 6’7 F Lenzy Hancock (University Christian School)- He has size, agility, and mobility. He transitions well on both ends of the floor. Has become a better finisher with both hands on the inside and is a solid passer on the interior. Sourcehoops looks forward to next year’s event being even bigger and better as we continue to uncover some of the hidden talents in the Tampa Bay area.